I suppose, in the end, its a simple obsession with speed, and, in particular, with the delicate balance between speed and control. I've never been particularly interested in motorbike racing - I watch the Moto GP sometimes, but I've never been more than a casual follower of the series, and I would struggle to explain exactly what the difference is between a Grand Prix bike, a Superbike and a Superstock Bike. There was no way, though, when an old friend invited me over to watch the Centenary Tourist Trophy races on the Isle of Man, that I could ever turn the offer down. For me, much of the appeal lay in the circuit itself. Older racing fans can get dewy eyed at the mere mention of the old Nordschleife, the monstrous 14 mile circuit which Jackie Stewart christened 'Green Hell'. The TT Mountain Course, however, is over twice as long, at 37 miles. It is not length alone, though, that makes the circuit so special, so much as the fact that it is made up entirely of public roads. How many of us race fans have not, at some point, daydreamed about making a race circuit out of the sweeping A-roads nearest where we live? Well, if the roads are really good in your area, and if you thought big, you just might end up with something resembling the TT course. Chances are, though, that it wouldn't feature anything so challenging as the downhill switchbacks at Union Mills, so spectacular as the bridge at Ballough which sends the bikes airborne, or so downright frightening as the mountain section. 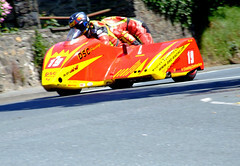 Up close to the action during the Senior TT at Ginger Hall. There are a couple of additional bonuses for spectators. Unlike almost any other motor race I can think of, it is possible for spectators to try their hand at a substantial section of the course for themselves. The race is held on public roads, and this year, for the duration of the 2 week event, the mountain section, which runs for 12 miles between the Ramsay Hairpin and Creg-Na-Ba was made one-way. Combined with the absence of any speed limits on open roads on the Isle of Man, this presents a rare opportunity for ordinary race fans to see what they can do on a real race course (and to find out how much they value their lives and limbs...) I'm not a biker myself, but a friend took me round at what he considered a rather sedate pace (still over 100mph in places) in his car and that was enough to give me some small flavour of what is is that the likes of John McGuinness, Ian Hutchinson. Dave Molyneux and Bruce Anstey had to contend with. Watching the bikes at Bradden Bridge, Tuesday. The other almost unique virtue of the Mountain Course is the sheer variety of places to watch the race from. So it was that I watched the Monday afternoon sidecar race from the beer garden at the Railway Inn, Union Mills, thinking that there really can't be any much more civilised way to enjoy one's motorsport. For a change of scene on Tuesday, I picked a spot in a church graveyard at Bradden Bridge (a quaint little Methodist place offering TT and Teas - for what its worth, another church put on a 'Mad Sunday Service') to watch the supersport race, and the embankment at Quarterbridge for the Centenary Parade. 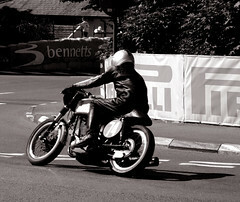 An old Norton sets off on a lap of the track during the Centenary Parade on Tuesday. 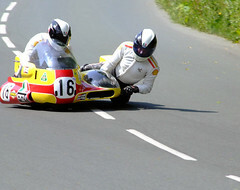 Dave Molyneux, 13-times Sidecar winner at the TT, demonstrating an older-vintage machine at the Parade of Champions. Maybe it is simply the fact that I don't normally watch bikes, but the other thing that struck me was how much easier it was to tell apart those who were really on it. In particular, John McGuinness' ultra-smooth lines, and gentle throttle control at Ginger Hall really stood out during the Senior TT on Thursday. It was easy too, to tell who was really quick during the Supersport 600cc race on Wednesday, simply from how early they were able to get onto the throttle through the fast 90 degree corner at Ballacrainie. 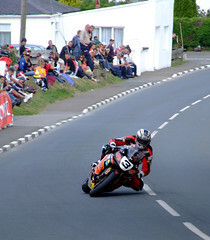 John McGuinness on his way to winning the Senior TT. Are there any downsides to watching the TT? As someone used to circuit racing, I have to admit that the fact that riders went off at 10sec intervals sometimes made it very difficult to work out exactly what was going on. Especially when the noise from the bikes often made it hard to make out the radio commentary. Undoubtedly too, you don't see as much on track action as at short circuit events. If 14 laps at the old Nordschleife for a Grand Prix leaves you feeling short-changed, then bear in mind that the 200+ mile Senior TT, the longest race of event, sees the riders come past just 6 times. Of course, the fact that there are 70+ runners in most events, and that they don't all come past at once, does ensure that you're not spending too much time twiddling your thumbs. There is, of course, a dark side to the TT. In its 100 year history, over 200 riders have been killed at the event, the last of those, Marc Ramsbotham, crashing fatally on the final lap of the Senior TT last Friday. It is not that the organisers of the TT don't care about safety, but rather that a race on a 37 mile road course, complete with telegraph poles, trees, concrete walls, sheer drops can never be safe, in the workaday sense of the word. It might be possible to engineer a racing car in such a way to enable Robert Kubica to come away from a near aircrash like shunt with only a sprained ankle but no safety equipment can entirely protect a rider falling from a bike at 150mph. There are those who would argue that a race which has killed so many riders, which has resulted in so much death, should be stopped. That, though, would be to ignore the wishes of the very people such do-gooders are trying to protect - the riders themselves. 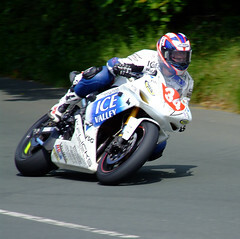 These days, the TT is a standalone race, not part of any world championship. No rider is unaware of the risks they are taking, nor is any rider forced into competing against their will. As David Jeffries, who was killed in 2003, put it "No-one is forcing me to go, I'm doing it completely off my own back. I enjoy doing it. There are so many things in life that you aren't allowed to do for some pathetic reason that some bloke in a suit has decided because it's dangerous or some other reason". Or, as Walter Scott put it "One crowded hour of glorious life is worth an age without a name". If you're a racing fan, you owe it to yourself to make the trip at least once - to see racing as it used to be - a modern form of gladiatorial combat, dangerous, frighteningly fast, and utterly spectacular. Get over there before the Health and Safety Inspectors or the Insurance suits kill it off forever. All photos are author's own. Photos may freely be copied and reused, providing attribution is given. The TT is the last oldstyle road race left and it ought to continue for that reason alone. Sports like F1 have made things very safe for the participants but they have also lost something in doing so. Perhaps passion is the word. When your life is on the line, there are no arguments about the letter of your contract or how many millions you'll be paid this year. A great post, Patrick, and you've made me even more determined to get to the Isle of Man someday at the right time.